I am trying to develop an Android app for my MetaWear C board that makes use of the Sensor Fusion data. Reading the documentation, it says that before I can make use of any of the sensors, I need to make a call to connectAsync() , nevertheless, the app crashes right after the method is called, and I still don't understand why. 2019-01-07 21:46:11.186 13465-13465/? E/HotwordDetector: Invalid or incompatible speaker models. Silent enrollment required. That error doesn't appear relevant to any MetaWear code. Use the debugger to check that your variables aren't null and make sure you have declared the MetaWear service in your manifest file. If I let the program continue running with the next line, which is where connectAsync() is called, the program crashes and the only error I get on the Logcat is what I posted earlier. What else can I try to make this work? Step though the conectAsync method with the debugger. There isn't much that can be done without knowing where the crash occurs. You can also try uisng the starter app template from the tutorial project. This is how I modified my code so it makes a Bluetooth scan to retrieve the board instead of passing it the mac address to create the object. The second part is the exception I get in the debugger. I'm sorry but I don't understand, what do you mean to use ```? Exactly what it says. Wrap your code with 3 backticks, otherwise it will not render correctly on the page. My app doesn't connect to Meta Motion Sensor R+. It keeps going to Update Firmware Screen. Tries to upload new firmware and then fails to connect. Tried all the steps listed numerous times with same results. Using Android phone. Last connection was this morning. My app doesn't connect to Meta Motion Sensor R+. It keeps going to Update Firmware Screen. 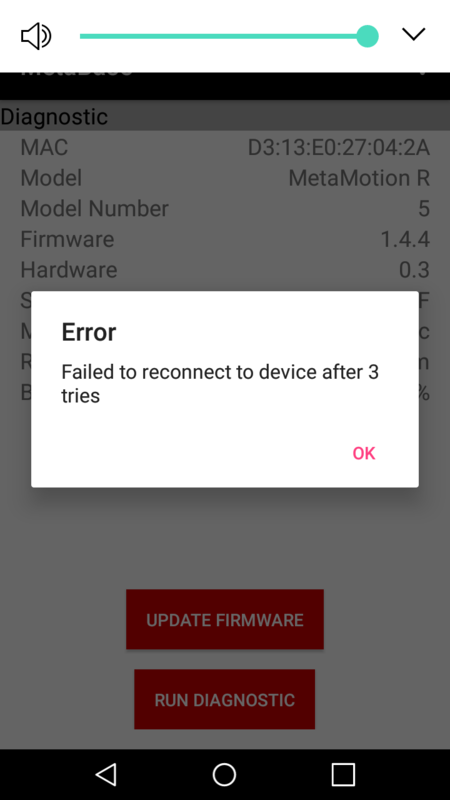 Tries to upload new firmware and then fails to connect. Tried all the steps listed numerous times with same results. Post unrelated issues in their own thread. Do not hijack existing threads. What is the state of the variables at that point? I figured out what was wrong! apparently, the ConnectAsync() uses some component from material design library, because right after I implemented material design on my project, the problem disappeared!